In establishing its identity at its inception in 1942, the then University of Ceylon decided that a coat-of-arms would not be in keeping with the traditions of an oriental country. 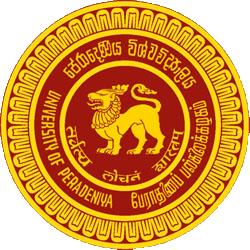 Instead, it chose a seal with a lion motif that has remained the university’s logo over the years although small changes were made during its transformation into the University of Peradeniya. The original Logo of the university consisted of a lion--the lion being the symbol of Sri Lanka-- surrounded by a circle containing the Sanskrit motto Sarvasva Locanam Sastram(knowledge is the eye unto all) and the words University of Ceylon in English. Outside the circle was a design of 'Pala Pethi', a symbol of purity and wisdom in indigenous art, represented here by stylized lotus petals of the Kandyan Period. The colours of the Logo are gold on maroon. In 1978, when the University of Peradeniya became an independent entity, the Council adopted the Logo of the University of Ceylon without the Sanskrit motto, but with the words University of Peradeniya in Sinhala, Tamil and English. The annual reports from 1979 came to carry the Sanskrit aphorism from Hitopadesha, Vidya Dadati Vinayam (Knowledge gives discipline). In 1991, the Council decided to restore the original Sanskrit Motto in the University Logo. As it was observed that the shape of the 'Pala Pethi' and the original colour combinations have changed over the years, the Council decided in 2011 to restore all the features of the Logo in accordance with its original design.